How fast can I upload and download at with my windows vps? The majority of our vps's are hosted on Quad Core Servers with 100Mbit Ports. 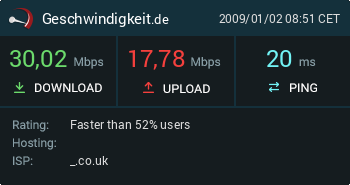 Upload and Download Speed is a difficult thing to judge unless your vps is on dedicated bandwidth. Most VPS's use huge shared bandwidth pools so speeds can vary depending on many things beyond our control. Can I use VNC / Radmin / GotoMyPC on my VPS to connect? Does my VPS use dedicated bandwidth? How can I transfer files to and from my windows vps? How do I add extra hard drive space to my VPS?